The New Kabbalah is a philosophy and Jewish theology grounded in the union between traditional Jewish mysticism and modern rational thought. 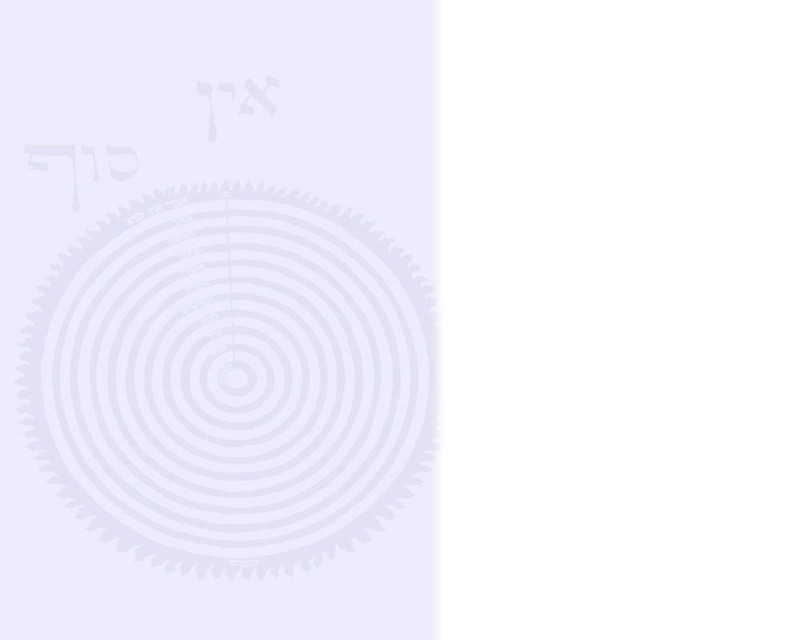 Rooted in the visionary mythos of Rabbi Isaac Luria (1534-72), and interpreted through such modern and postmodern thinkers as Freud, Jung, Hegel, Wittgenstein and Derrida, the New Kabbalah seeks to uncover and further develop the philosophical and psychological significance of Kabbalistic symbols and ideas. In addition, the New Kabbalah is enriched by comparative studies and dialog between Jewish mysticism and other religious and philosophical traditions, including Hinduism, Buddhism, Platonism, and Gnosticism. The New Kabbalah is born out of the conviction that the theosophical system of Luria and his followers promotes an open economy of thought, dialog and criticism, while at the same time providing a comprehensive account of the world and humanity's role within it that is intellectually, morally and spiritually vital for us today. The New Kabbalah seeks to build upon the recent explosion in contemporary Kabbalah scholarship by formulating a Kabbalistic approach to philosophy, theology and psychology. The New Kabbalah is open, multi-perspectival and pluralistic, and while it is rooted firmly in Judaism, it seeks dialog, participation and constructive criticism from those of all backgrounds and disciplines. This site is not affiliated with any "movement," but seeks to promote respectful dialog across the full spectrum of Jewish affiliation and non-affiliation. Click here for An Interview with Sanford Drob on Kabbalah and Psychotherapy. Click here for pdf version . A general description of the Lurianic Kabbalah, with links providing interpretations of key Lurianic symbols and ideas, and discussions of the relationship between Jewish mysticism and various systems of ancient and modern thought. Symbols of the Kabbalah: Philosophical and Psychological Perspectives (Jason Aronson, 2000). Kabbalistic Metaphors: Jewish Mystical Themes in Ancient and Modern Thought (Jason Aronson, 2000). Kabbalistic Visions: C.G. Jung and Jewish Mysticism (Spring Journal Books, 2010). Reading the Red Book: An Interpretive Guide to C. G. Jung’s Liber Novus (Spring Journal Books, 2012). Articles on Jewish mysticism and other topics of Jewish, theological and philosophical interest. A biographical sketch of the author's grandfather Rabbi Max Drob. 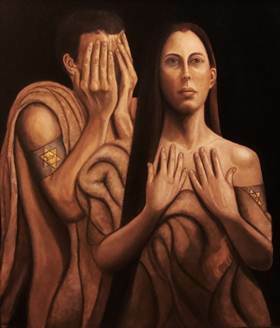 Sanford Drob’s oil paintings, “The Expulsion,” “The Sacrifice” and “The Accusation” which together form “The (In)humanity Triptych,” re-envision three biblical narratives; the Expulsion from Eden, the Sacrifice of Noah, and Esther’s Accusation of Haman, through the lens of the Holocaust. These narratives are understood by the artist to represent the Kabbalistic themes of exile, rupture and repair. An interview with the author, which appears in the December, 2000 issue of the Jewish Book News. Send Email to the author or post your own views, constructive criticism, or ideas pertaining to the themes discussed on this website and related publications. Some ideas for collaborations on new projects relevant to the New Kabbalah. Previous publications and work in progress pertaining to the author's research on Carl Gustav Jung and Jewish Mysticism. Articles on the Kabbalah and related topics, originally appearing in the New York Jewish Review, a publication founded by the author and Harris Tilevitz. Photograph of Dr. Drob and Mr. Tilevitz receiving a blessing from the late Lubavitcher Rebbe regarding this publication. A brief biographical sketch of Sanford Drob. Information regarding Dr. Drob's Lectures and Workshops. Links to other websites relevant to the New Kabbalah. Links to Jewish and non-denominational organizations doing important charitable work, to which you may wish to make a contribution. (Journal of Jungian Theory and Practice, Journal of Jungian Theory and Practice, Vol. 7, No. 1, pp 33-54). S. Drob: The Coincidence of Opposites in Jewish Mysticism.. The author discusses the role of the opposites in Jewish mysticism, considers the Kabbalistic notion that the divine is the union of all contraries, and argues that the Jewish Mysticism points to a way of thinking that permits one to embrace even ideas and perspectives that appear to contradict one another (e.g. that God created humanity and that humanity creates God). In S. Drob: A Rational Mystical Ascent the author makes use of the notion of coincidentia oppositorum to develop the theme of a rational-mystical ascent to the absolute. The major symbols of the Lurianic Kabbalah are examined from both theological and psychological points of view. It is argued that these symbols provide the basis for a conception of God that is spiritually and psychologically meaningful, while at the same time suggestive of, and fully compatible with, the open-ended, diverse, and multicultural mode of experience and understanding that is often thought to herald the demise of faith and provide the basis for an atheistic critique of religion. The Lurianic symbols are shown to reflect a form of consciousness and a conception of divinity that is characterized by “unknowing,” diverse perspectives, multiple interpretations, the deconstruction of dogma, the potential revision of all ideas, the interdependence of contrasting beliefs and attitudes, and the celebration of diversity and difference. The author continues the process, begun by Jung, of rethinking the meaning, function, and experience of religious symbolism in the context of modern and postmodern sensibilities, and in the wake of the declaration of the death of God and the loss of meaning of religious myths and symbols. How the Kabbalistic conception of the Absolute (Ein-sof) must lead us to a conception of the divine and religion in general that is entirely free of dogma. Contemporary scholarship on the Kabbalah has focused considerable attention on the Kabbalist's views of language and interpretation. One reason for this is, as Moshe Idel and others have observed, is that there is an important affinity between the Kabbalistic conception of infinite layers of meaning in scripture and contemporary philosophical ideas regarding the infinite interpretability of both texts and the world. In this essay the author shows how a careful consideration of Kabbalistic notions of "infinite interpretation" can not only lead to a new understanding of the relevance of Kabbalah to contemporary thought, but also to a radical new understanding of the Kabbalah's attitude toward "Torah" and religious life. S. Drob: The Red String. Dialog on the Kabbalistic significance of wearing a red string that has been tied around the tomb of Rachel. Dialog on the Kabbalistic Kabbalistic equation of Ein-sof with "Nothingness" and the problem of creation out of nothingness. S. Drob: The Lurianic Metaphors, Creativity, and the Structure of Language. The author shows how the Lurianic metaphors of Ayin, Ein-sof, Tzimtzum, Sefirot, Shevirah, and Tikkun, provide an account of both human and divine creativity and language. The author is in the process of developing a New Kabbalistic "Tree of Life" which interprets Isaac Luria's theosophical system from an axiological point of view. Each branch or "leaf" on the "Tree of Life" represents a value that is implicit in Luria's theosophy. The values are depicted in the opening table/tree and the author's detailed explanations will appear as notes below. Sanford L. Drob, Ph.D. is on the Faculty of the doctorate program in Clinical Psychology at Fielding Graduate University. Dr. Drob holds doctorates in Philosophy and Clinical Psychology. He is the author of Reading the Red Book: A Guide to C. G. Jung’s Liber Novus (Spring Journal Books, 2012), Kabbalistic Visions: C.G. Jung and Jewish Mysticism (Spring Journal Books, 2010), Kabbalah and Postmodernism (Peter Lang, 2008), Symbols of the Kabbalah: Philosophical and Psychological Perspectives, and Kabbalistic Metaphors: Jewish Mystical Themes in Ancient and Modern Thought (both published by Jason Aronson, 2000). Dr. Drob served as head psychologist on the Bellevue Forensic Psychiatry Service from 1984-2003 and was for many years the Director of Psychological Testing at Bellevue Hospital in New York City. He maintains a practice in forensic psychology in New York, where he also maintains his painting studio. His (In)humanity Triptych reflects a Lurianic understanding of three biblical narratives in relation to the holocaust.